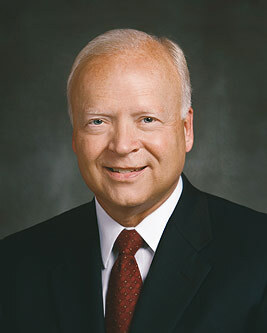 Kent F. Richards was sustained a member of the Second Quorum of the Seventy of The Church of Jesus Christ of Latter-day Saints on April 4, 2009. He was granted emeritus status on October 1, 2016. He has also served in the Church as president of the Texas San Antonio Mission (1998–2001), stake president, high councilor, bishop, and full-time missionary in the Southern Mexican Mission. He was born on February 25, 1946, in Salt Lake City, Utah. He earned his bachelor’s degree from the University of Utah and went on to earn his medical degree three years later. His career included surgeon for IHC Bryner clinic, Intermountain Healthcare senior vice president for four years, clinical professor of surgery at the University of Utah, chairman of the department of surgery at LDS Hospital, and member of the board and executive committee on the IHC board of trustees. Richards and his wife, Marsha, are the parents of eight children. She served on the Young Women general board from 2002 to 2008. He edited the book A Family of Faith: An Intimate View of Church History through the Journals of Three Generations of Apostles. He is a descendant of these apostles, Willard Richards, Franklin D. Richards, and George F. Richards.